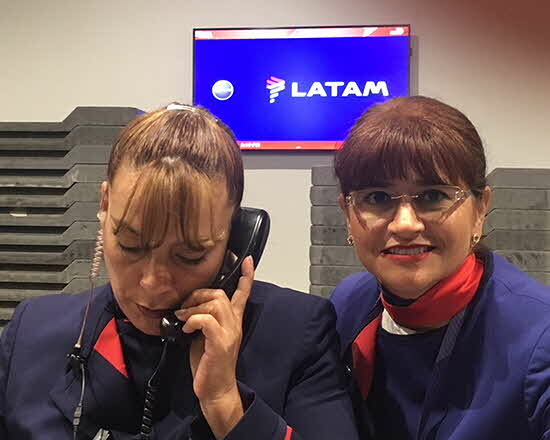 Following the merger of LAN-Chile and TAM Airlines, the LATAM Airlines Group flies to approximately 140 destinations in 25 countries throughout Latin America, and has International service around the world. LATAM is aggressively expanding their direct and non-stop routes from the U.S. to Brazil, pursuing new opportunities to grow culturally as well as strategically. 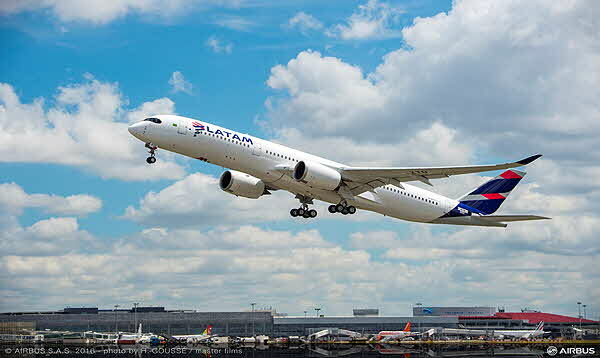 By hiring multi-cultural employees from all over Latin America, language barriers have been overcome as employees speak Spanish as well as Portuguese.“Connecting the U.S. and Brazil is one of our top priorities at LATAM Airlines, as travel between these countries continues to grow," said Pablo Chiozza, senior vice president, LATAM North America and Asia. "We are proud to further fulfill this vital role in the South American region with our new direct route connecting two dynamic cities, Miami and Salvador de Bahia, and excited to launch non-stop from Boston to Sao Paolo, July 2nd. First class service has been replaced with an expanded number of Premium Business Class seats; by changing the configuration to accommodate flat beds, more passengers have the opportunity to enjoy first class service in Business Class with focus on comfort inside the aircraft. 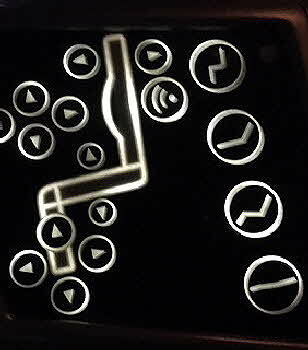 Economy Class passengers are treated to business class service and made to feel as close to home as possible: there is a choice of three dinner entrées (menus change every three months); all alcoholic beverages are complimentary, and entertainment, head sets and soft blankets are free. My recent Premium Business flight from Miami to Salvador de Bahia surpassed expectations: from the friendly efficient check-in, assisted by Marcel Martins, Duty Manager, to the sunny welcome aboard, in-flight impeccable service, delicious hot meals and snacks, top of the line stereo headphones, multiple seat reclining positions (including a massage mode), down comforter, privacy panel and large oversized TV screens. Marcel tell me: “our priority is our customers we call clients, as they are more than just “passing through”. Head Purser Paulo, a 20-year veteran with the company, greets me by name as I board; he later tells me: “there are many positive changes since the merger of LAN and Tam, the company is more concerned about passengers; flying and making the flight a memorable experience makes me happy”. 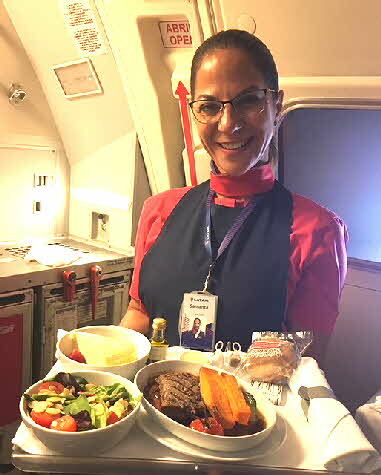 After a lovely dinner: lamb, vegetables, salad, desert … and a few glasses of excellent wine, I recline my seat into a flat bed, and spend the rest of the flight dreaming of what awaits when we land. Departing Miami on Sunday at 4:55 pm was quite civil. After an overnight flight, I arrived refreshed and relaxed; clearing customs early morning was a breeze. BM Tours’ guide Paulo Moreira dos Santos greets us at the airport; it is a short drive to the seafront Mar Brazil Hotel; Director Renata Proserpio, and her daughter, are waiting to greet us. After a short rest, we gather in the Hotel’s Casa di Vina Restaurant and museum, once the home of Portuguese poet and composer Vinicius de Moraes who wrote the lyrics for “The Girl from Ipanema”; his typewriter, guitar and other preserved memorabilia tell the story of his far-reaching influence and love affair with his fourth wife, Gessi Gesse. Bahia has inspired, and been home to, many famous artists and writers; Jorge Amada, being one of them; his home has also been turned into a museum. 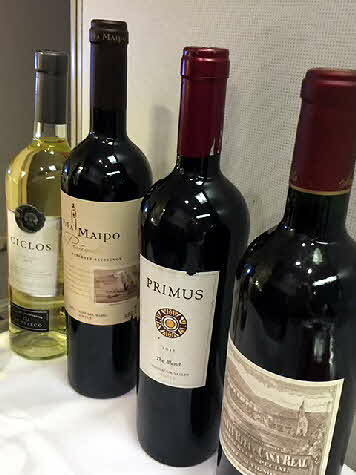 We break bread with a warm welcoming lunch; I order the yellowtail served with lemon risotto; we toast to Bahia with a lovely Brazilian white wine. Renata, tells me: “all the time we are happy here; always in a good mood”. Salvador de Bahia, has an energy and unadorned beauty few cities can match; it is a city of sharp and vivid contrasts… an intoxicating fusion of African, Portuguese and Indian cultures, traditions, religions, foods and music. It is a vibrant tapestry, woven with deeply rooted textured threads, many tied to African religious devotion and ceremonies; song, dance and celebrations are at the core; 85% of the population is black; several African languages are spoken, Yoruba, the most common; many tourists come here looking for their roots. After lunch, we tour the Pelourinho. and visit the Sao Francisco Church, known as the gold church. Then, at the Bonfim Church in the Lower City, I follow the tradition of tying three different color ribbons on the gates of the church, a symbol of asking the saints for protection, good luck and the granting of three wishes. 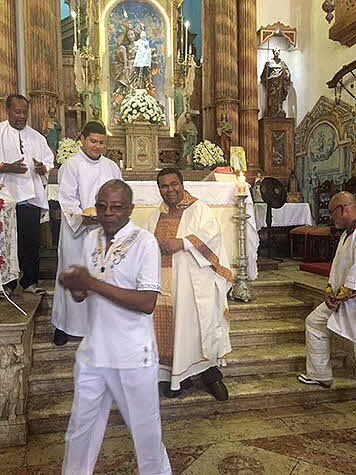 Inside the church, I observe a deeply moving, seldom seen, Candomblé initiation ceremony. Paulo tells me “one might bring a wax replica of a body part to the Catholic church to ask for healing; this is called syncretism, the merging of two religions”. Salvador’s brilliantly hued center is a living museum of 17th- and 18th-century architecture and gold-laden churches. More importantly, Salvador is the nexus of an incredible arts movement. Wild festivals happen frequently, with drum corps pounding out powerful rhythms against the backdrop of colonial buildings. 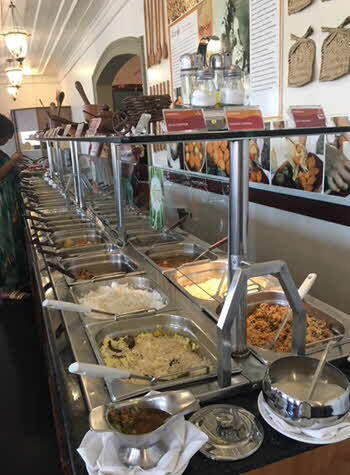 At night, we sample a typical Bahian buffet, and watch a colorful fast paced Bahian cultural folk show at Coliseu Restaurant; then wander the cobblestone plaza; the scent of acarajé (bean and shrimp fritters), and other African delights, fill the evening air. We stop at a bar to sample Cachaça, originally made by slaves for their own consumption; it later became the favored drink of Brazil. 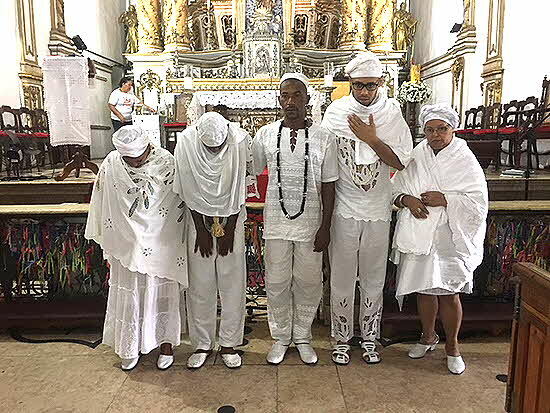 I am told that elsewhere in town, religious followers are celebrating and reconnecting with African gods at mystical trance induced Candomblé ceremonies. Orishas are African deities. Religious rituals, offerings and worship of Orishas play a spiritual role in their lives. There are 19 Orishas in Bahia; each relates to a day of the week, a month and a color. There are many Candomblé Houses of worship around the city; their religion gives soul and meaning to inanimate objects; specific rhythms and chants through drumming, singing and dance summon different Orishas. The House of Music, is in the middle of an environmentally protected area on the edge of Abaete lagoon; their mission is to preserve the identity of the neighborhood (mainly fishermen), passing on and preserving its history through art, exhibitions and performances. Amadeo, the Director, and Renata have planned a special surprise. We follow them, and two washerwomen in traditional dress, to the edge of the lagoon; A young boy leads his gray horse into the lagoon, and cupping his hands splashes water on the horse; a local woman, with a child by her side, is fishing with a bamboo pole. We join hands in a circle singing and dancing; Amadeo strums on his guitar. it is an honor to share such a moving moment with people I may never see again. 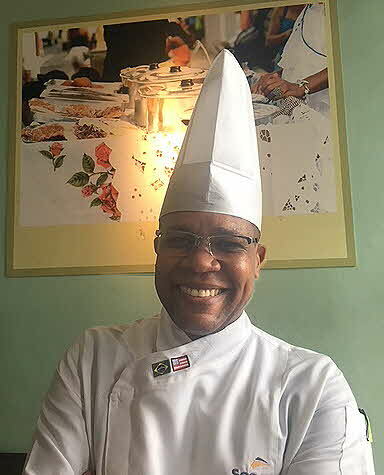 Josemilton Santos has been running the Senac Culinary School, the first in Latin America, as chef du cuisine for 25 years, managing three restaurants and overseeing culinary classes. The school’s $18 lunch buffet, open to the public, serves a variety of 40 symbolic, indigenous, and historical dishes and desserts. Near to the school is a small beautifully curated Culinary Museum, its exhibits, which change every three months, focus on coffee, culture and gastronomy. Paraiso Tropical Restaurant sits on an Atlantic Rainforest that survived the development of the city. Beto Piomentel, owner and chef is called an alchemist pioneer and innovator, due to his knowledge of gastronomy. In Bahia, there are two culinary movements: traditional and new Bahia. He cooks authentic, healthier, lighter and more nutritious dishes made with pure fruits; his flavors change as fruits ripen. We are served an overwhelming array of artistically plated delicious dishes along with a variety of salsas and farinas we learn to sprinkle on all our food. I taste Caragu for the first time, a seafood, harvested from the mangroves; labor intensive to clean and prepare as they are very tiny; it takes hundreds to make a portion. In Bahia lunch is the big meal with dinner being a lighter snack, perhaps leftovers from lunch. Mercado Modelo, in the Rio Vermelho neighborhood is a testament to the Bahiana’s lifestyle. This modern airconditioned market is a joy to explore, a place locals shop for the freshest fish, meats, farinas, coffee and all the interesting spices and condiments that go into Bahian cooking. My room at the Fera Palace Hotel is quite comfortable. Sunsets on the rooftop terrace are spectacular. I swim a few laps in the infinity pool as the sun drops into the sea. 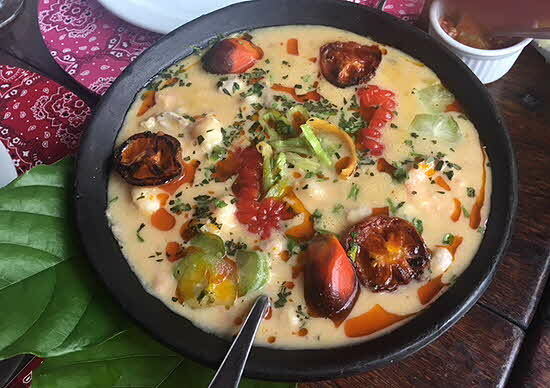 The hotel, is a restored art deco jewel with a happening lobby bar and restaurant; breakfast buffets are inviting; dinners a delicious mix of traditional and local dishes; I especially enjoyed the beiju, tapioca sweet croquets made with yucca. Fafa de Belem, one of Brazil’s Internationally acclaimed singers is in town for a concert, and thanks to Willie’s friend Marcelo, we score front row seats; it is an inspiring night with a chance to meet and mingle with an eclectic mix of locals. The popularity of Salvador’s free Carnival attracts millions; its newly opened Casa Do Carnival da Bahia Museum follows the colorful pulsating history of carnival; it tells a fascinating heart wrenching story; Africans, banned from participating in carnival; created and wore masks to hide their identity and color. The people of Bahia, proud of their heritage and religion, have struggled to have their voices heard… and still have far to travel. Mother’s Day Mass at the African Church gives new meaning to living together in harmony with love. The rhythm of bongo drums, spiritual hymns, the passing of the “mother of the year” crown… and a sermon in Portuguese, I may not have understood, but the passion behind his words touched me deeply. At a luncheon with local officials, including Arany Santana, Secretary of Culture, Jose Alves Peixoto, Jr. Secretary of Tourism for the State of Bahia, shares his hopes for Bahia’s future. “It has been over three years since we had a direct flight from the U.S. LATAM’s new service from Miami is making it easier for tourists to arrive and leave; we are on the right path in attracting more tourism; our infrastructure is in place … subways, buses, good roads and cable car. An art deco building, being restored into a 100 rooms superior hotel, is scheduled to open in December 2018. We are ready to receive more people from the United States with open hearts and happiness”. As my LATAM 737 taxies down the runway and lifts its nose into the sky, I cling to my newly awakened connection to the Bahiana way of life … its magnetism and mysticism has seeped into my pores, and I am grateful for the tastes, sounds and emotions so many shared in welcoming me into their warm, happy and sunny embrace. I am reminded of Willie’s words “Bahia is for those who deserve it”. Bahia has many stories to tell; I heard but a few. © June 2018 LuxuryWeb Magazine. All rights reserved.